Terminal 3 is Heathrow's second busiest terminal handling over 17 million passengers a year. Most popular destinations from here are to the USA followed by Canada, Japan and Singapore. Notable is that terminal 3 has its own dedicated landside prayer area. Terminal three has self service check-in facilities that can currently be used by passengers flying with Air Canada, American Airlines, British Airways, Gulf Air, Japan Airlines, SAS and Virgin Atlantic Airways. Some airlines let you check-in online. Check with your carrier but currently these airlines have this facility British Airways, Cathay Pacific, SAS, Singapore Airlines, Turkish Airlines and Virgin Atlantic. This terminal also has shower facilities located in the departures lounge. Start your holiday stress free in a terminal 3 executive lounge. Escape the busy terminal, irrespective of your airline or class of travel. Relax and enjoy comfortable seating, help yourself to drinks and snacks or complete some last minute business. The Lounges have all the facilities you need to relax before you fly. Air Canada, American Airlines, and Virgin Atlantic also provide a first class lounge available to passengers on arrival at Terminal 1. 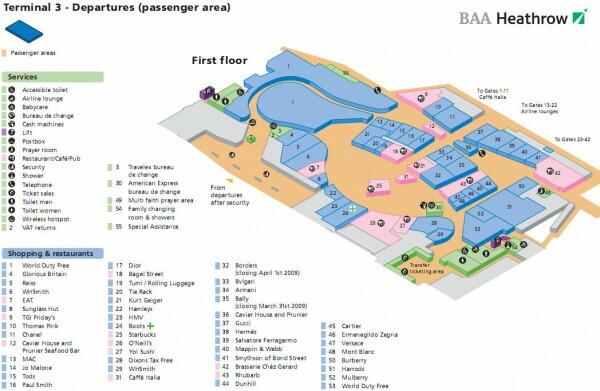 Contact the individual airline for more information about the lounges they provide in Terminal 3. Heathow Airport is easily accesible by car. Heathrow Airport is 15 miles west of London on the M4 motorway, near the M25 interchange.Terminal 3 is located at the centre of Heathrow airport close to terminal 1 and terminal 2. Exit the M4 (junction 4) or M25 (junction 15) and follow signs for Heathrow Terminals 1 and 3.